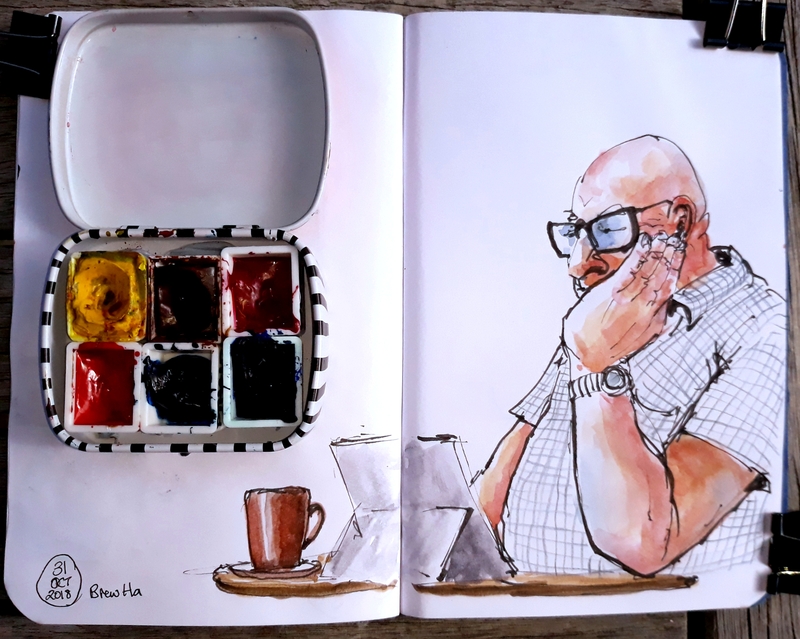 I’ve been tinkering with a very limited 6 colour palette for quick and secretive sketches….in a cafe I like to add colour if I can but sometimes don’t want to draw attention by unfolding a larger palette. That’s where the “mini” palette comes out to play, the tin cost about $4 and the lid and base were already coated with enamel paint so I just put a couple of strips of blue tack on the base. 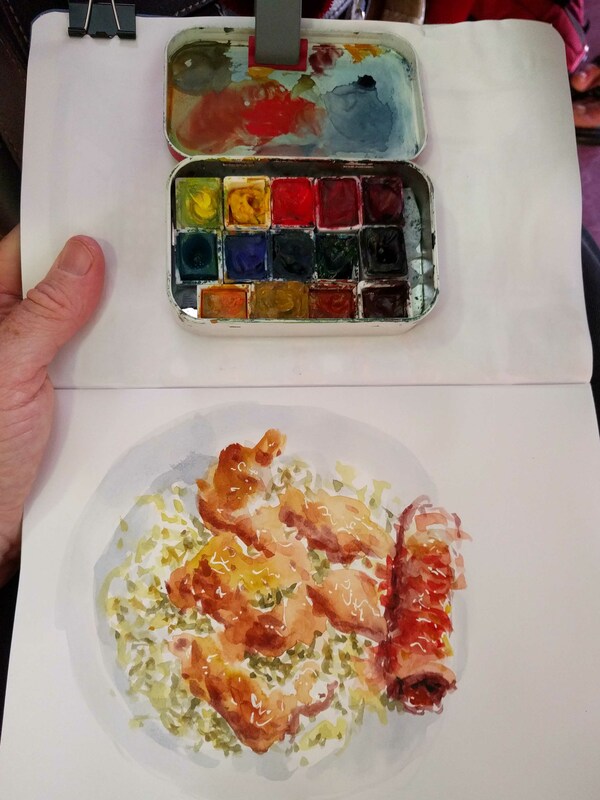 The tin only holds 6 half-pans and is small enough to fit in the palm of my hand….the below sketch is on an A6 notebook which hides inside my fauxdori, combined with a small waterbrush I can happily paint…. 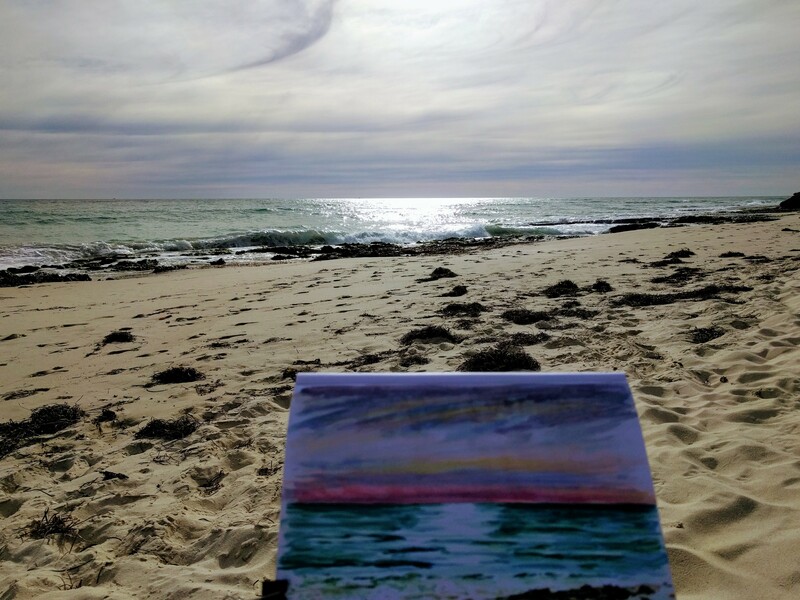 Colours I have below are: Hansa yellow medium, Burnt sienna, Permanent rose, Winsor red, Pthalo blue (green shade) & Ultramarine blue. The sketch was drawn with my TWSBI Eco fountain pen and EF fude nib in De Atramentis document black ink. 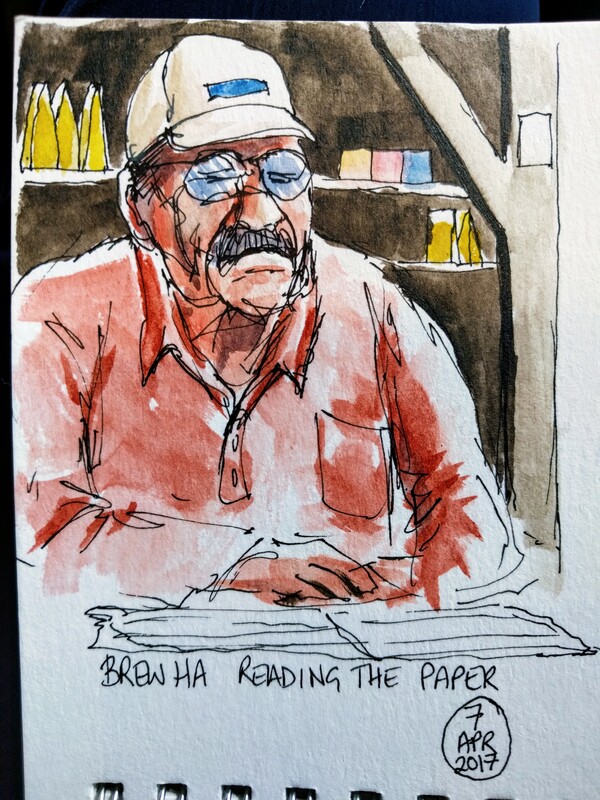 Sketching people in cafes is one of my favourite things to do….a good coffee, read the newspaper then find someone else doing the same and sketch them very quickly without them noticing. I draw directly in ink without pencil under-drawing for two reasons….Firstly because an under-drawing adds extra time (which I don’t have)….. Secondly because drawing directly with ink forces me to look really closely to the subject before putting ink on the page….with waterproof ink I’m totally committed to each line (I do make mistakes but they are either incorporated into the final picture or simply ignored – life is not perfect either). 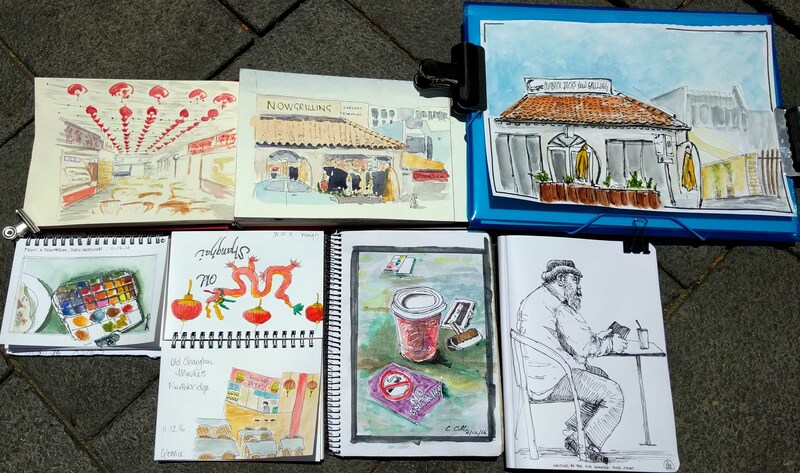 Before putting pen to paper I decide on the story I want to tell and develop a mental image of how I want the final sketch to look – the composition on the page – what will be included / how much / where to place things for maximum effect. 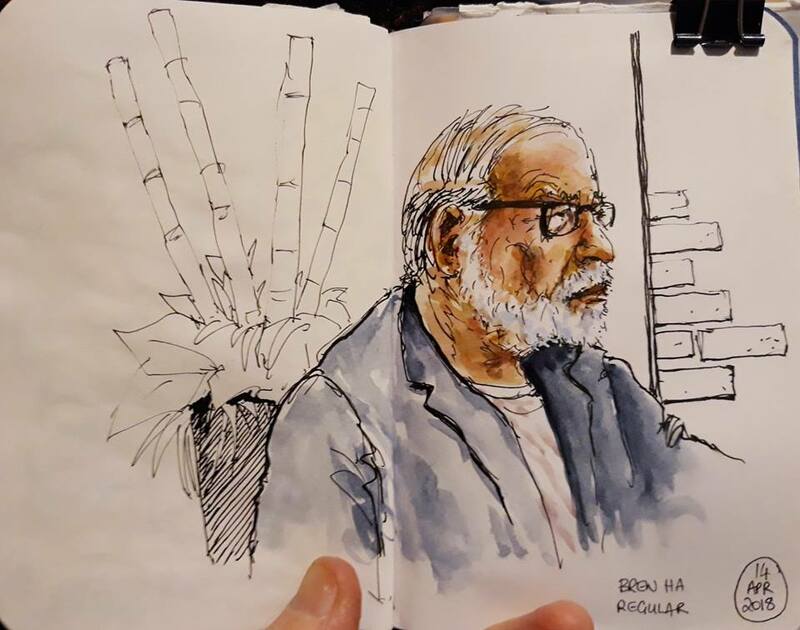 I usually start drawing a person with the nearest eye and draw out from there, looking for connecting and intersecting lines – assessing the geometry of the face (drawing is a really about triangulation). The drawing on this probably took about 15 minutes, with about 20 minutes for watercolour – adding paint into already wet washes to get graded colour. As for the choice of subject (or victim!)…. anyone who has just sat down with a full cup (so I know they will be there for a little while). Interesting faces and expressions (some people get involved with the news articles and make lots of facial expressions when reading). 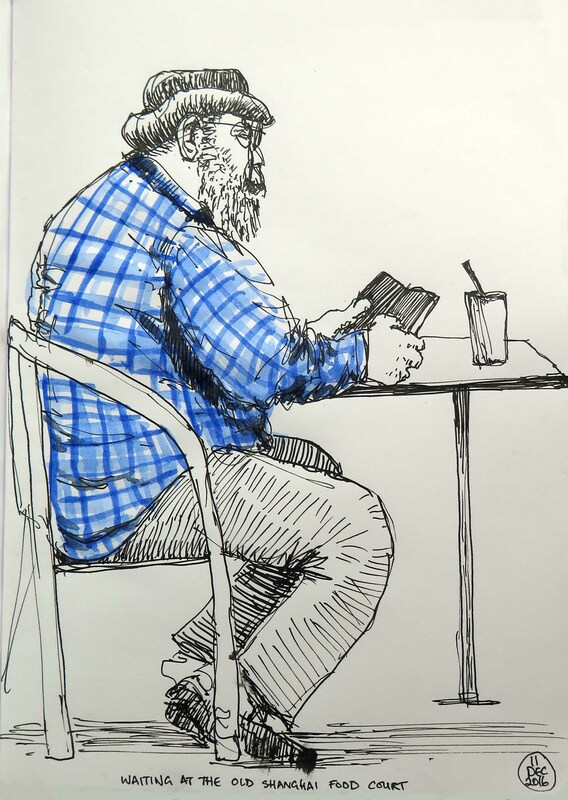 The guy below had a lovely soft white beard and thinning hair on top that I wanted to try to capture…..
Sketching with the Urban Sketchers Perth at Green’s Cafe in Leederville yesterday together with UK sketcher/illustrator Lynne Chapman and Sydney sketcher Liz Steel. 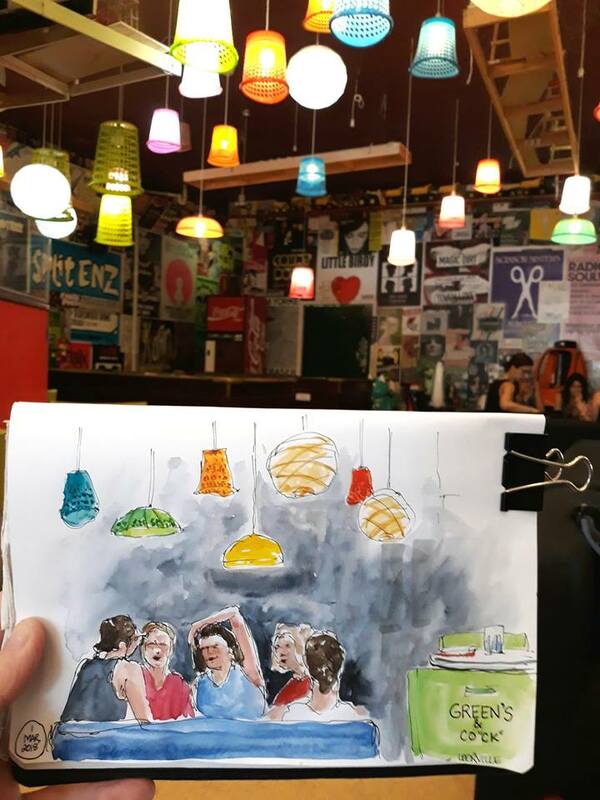 Green’s cafe always has great music and atmosphere, the colourful lampshades hanging down from the ceiling (plastic waste paper baskets) were really fun. The women in the background were very deep in conversation. 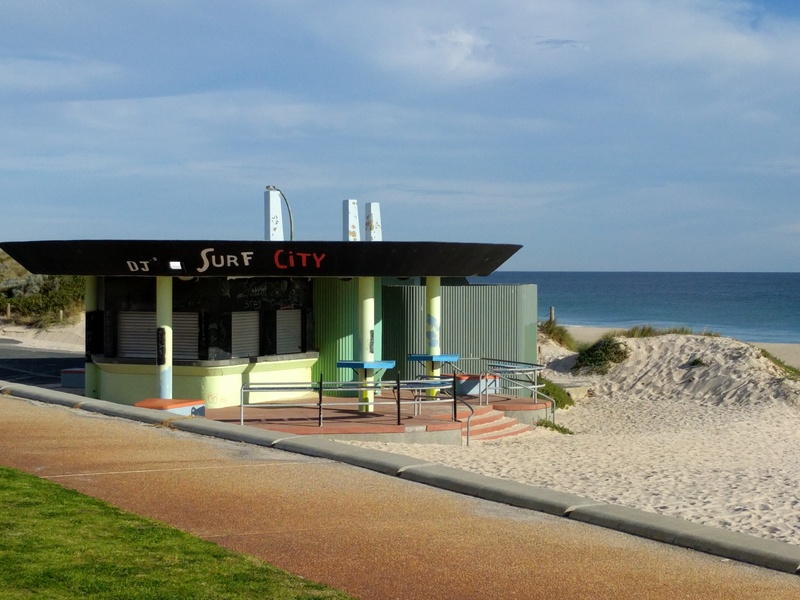 This is the little kiosk at the South end of City Beach….I don’t think that it’s open anymore as there are new cafes higher up the beach that have opened recently…..
Below an unsuccessful attempt to capture the pale winter sun shining through high clouds at North Cottesloe. The sky colours were delicate yellow, peach and pale blue. 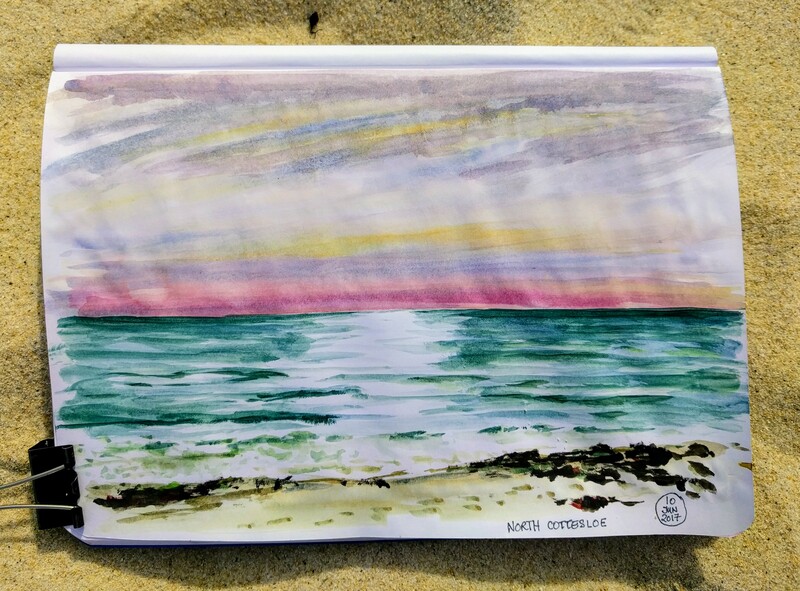 I really should have taken proper watercolour paper to attempt this….needed lots of watery paint….and the ability to lift colour out again….another lesson learnt! 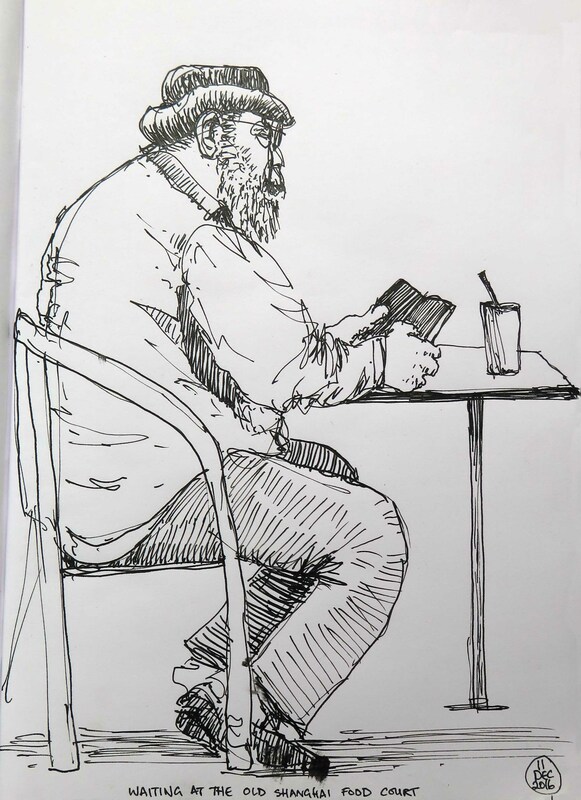 Had no time for getting out and about sketching recently….way to busy….finally a bit of “me” time….in my usual cafe…. 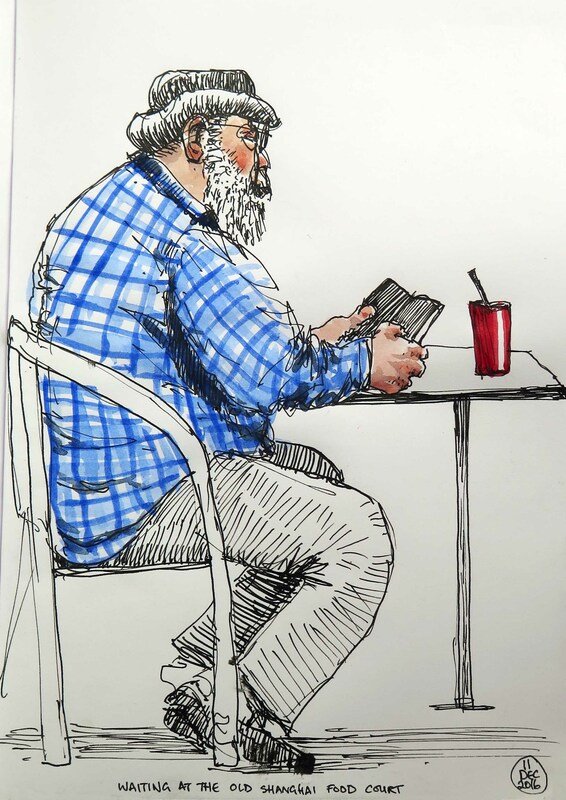 The Urban Sketchers Perth met this morning at the Old Shanghai Food Court in James Street, Northbridge for our monthly sketch-meet. We started with some blind contour drawings of each other to warm up (and have a laugh at the results!!!). I think it’s really important to warm up before starting sketching….it loosens the fingers and relaxes the mind before starting a “proper” sketch. This is my blind contour sketch of Heather…it has some elements of her character (except that she doesn’t have 2 noses!). 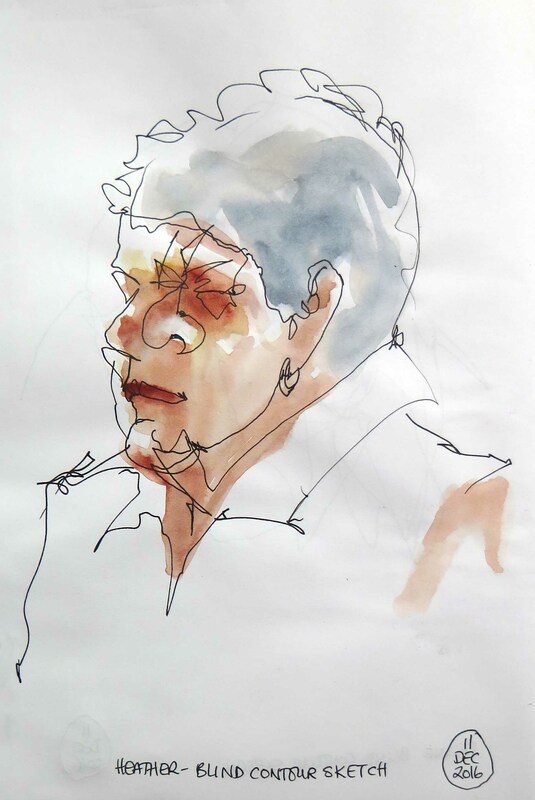 To do a blind contour drawing there are only 2 rules…..don’t look down at your paper and don’t take the pen off the page….try to slowly follow the outlines and form changes with your pen/pencil and feel your way around the object you are viewing. Invariably it won’t be accurate but it is a lot of fun and always brings laughter from the sketcher and the subject. 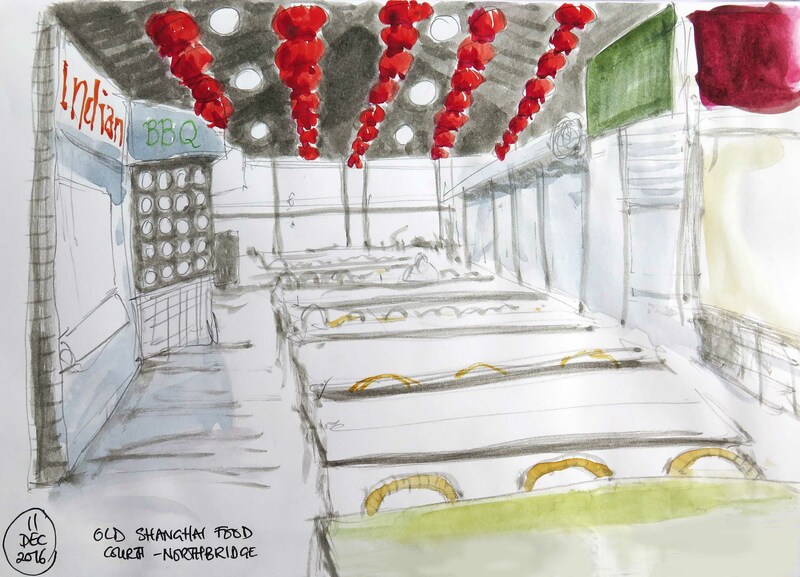 This is my quick sketch of the interior of the food court…quite dark except for the lovely bright red paper lanterns and the neon signs of the food vendors. We arrived at 10am when the place was empty of customers…only the cooks preparing the delicious foods. This is the honey chicken, rice and spring roll that I enjoyed….sketched first…about 20 minutes…yum. These three images are of a guy checking his phone whilst waiting for his food to arrive. 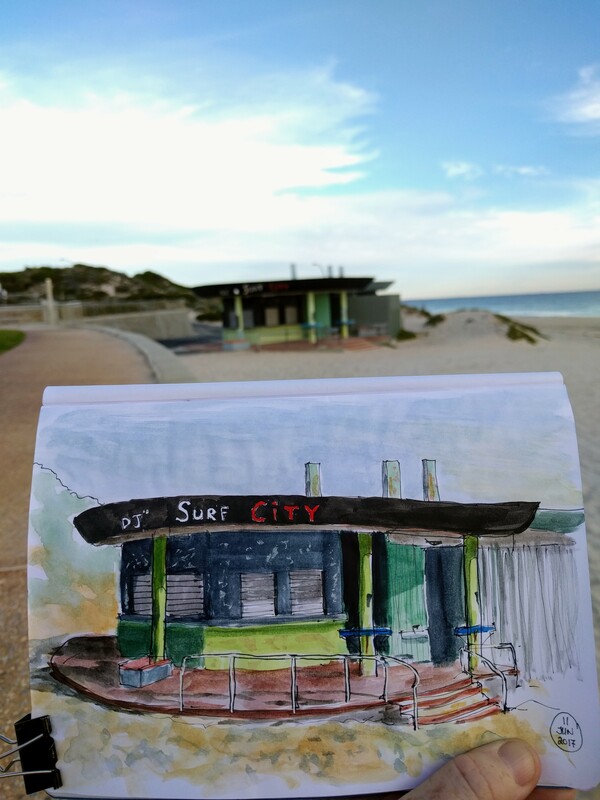 I drew on location with my trusty Lamy Safari fountain pen and De Atramentis black ink. The watercolours I added later at home from memory in stages, taking photos in between to see how the colours changed the feel of the sketch I can’t decide which version I prefer the original pen only sketch or the final with the red cup…..
Last but certainly not least…..everyone’s sketches from this morning….what a variety of different scenes that everyone chose to draw….we were all sitting around the same table but focused on different things….